….and the more I thought about it, the more I realised it’s true – I do love to see raindrops on flowers after the rain. But extremes of weather often make the TV news, and the UK in particular has been battered by storms and flooding over the past months, so your interpretation of AFTER THE RAIN might be very different from mine – and that’s where the fun begins. For the CBBH Photo Challenge during March I want you to post images of your experience, AFTER THE RAIN. This is the graceful False Pepper tree (Latin Name: Schinus molle) in my garden, with its clusters of pink peppercorns. I’ve think I’ve read somewhere that the peppercorns are edible in moderation, but I’ve never been brave enough to try them. Besides, they look great, just where they are …. 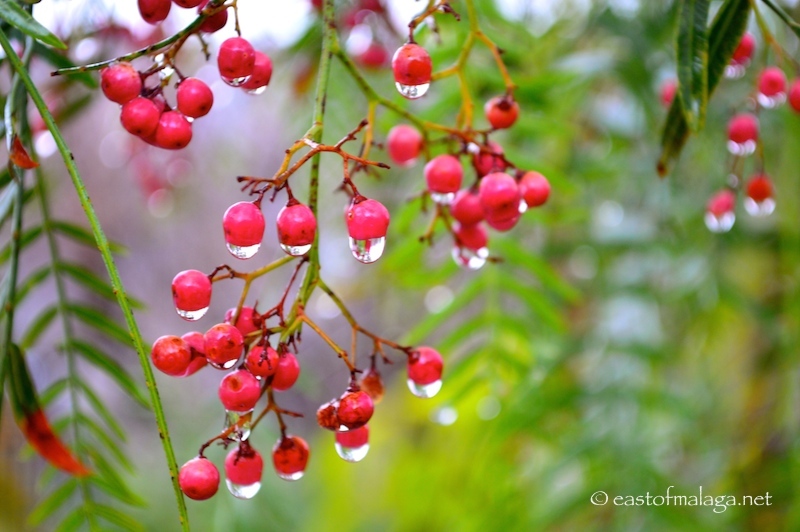 especially after the rain, when the raindrops clinging to them are of similar size. 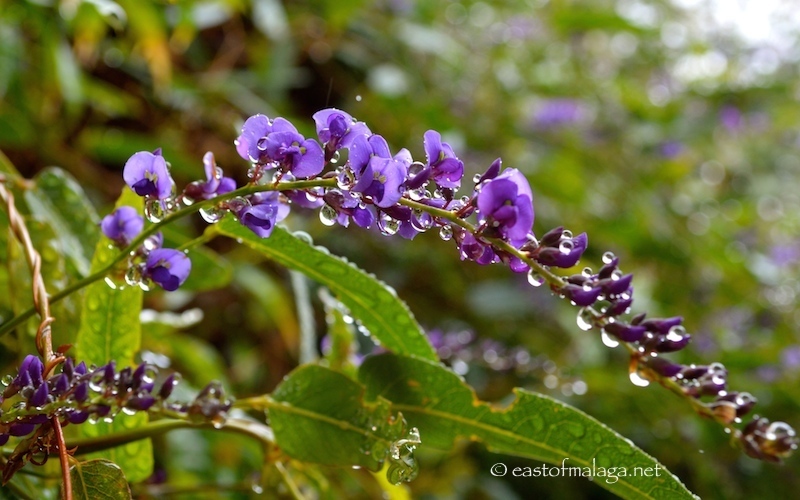 I love the elegant arching purple flowers, which are even more beautiful after the rain. 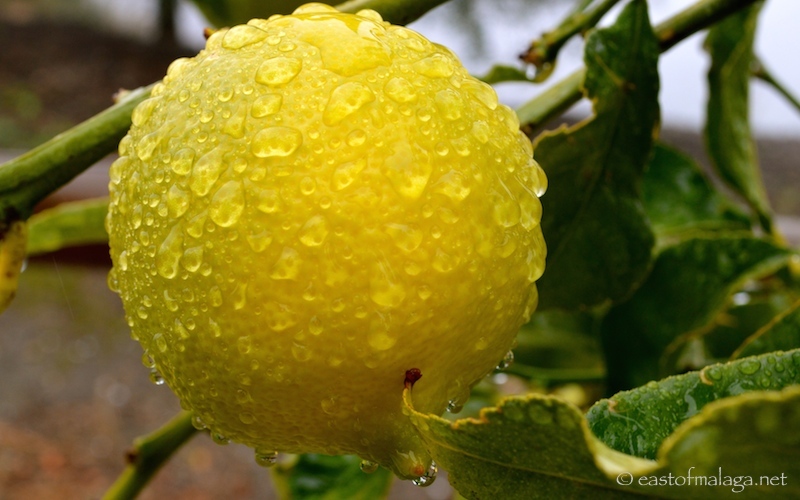 My final photo for this month’s challenge is of the raindrops clinging to one of the fruits on the lemon tree. I never fail to be delighted at being able to nip outside, at almost any time of year, and pluck a fragrant lemon from the tree. Don’t forget that the CBBH Photo Challenge is a little different from some other challenges, in two ways. First, it’s only once a month – giving you lots of time to consider your entry before the end of the calendar month. 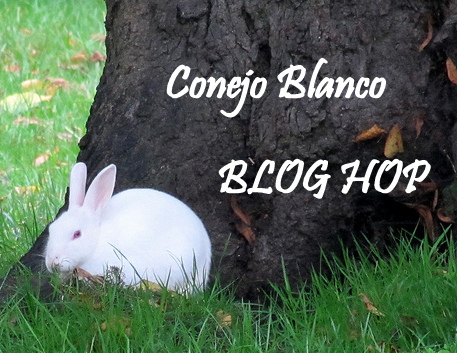 Second, and most important, this is a BLOG HOP (after all, it is the CBBH – Conejo Blanco Blog Hop, conejo blanco means white rabbit in Spanish), so DON’T FORGET that in your post you need to add links to two blogs that you have visited and commented on during the past month. That way, when we visit each other, we can HOP OVER to your links, connect with others and share a little blog love around! *** Hola Yessica follows the adventures of Jessica who grew up in California, but now lives in beautiful Barcelona. If you’re looking to discover the very best of what the Catalan capital has to offer, then Jessica’s your girl! Her new video series, “My Barcelona” includes insights as to why football really is a religious experience in Barcelona and explores the fabulous street art around the city. *** The best way to appreciate the culture of any area is through its food and its wine. And nowhere is that truer than in Annie B’s Spanish Kitchen. Annie shares the delights of living in Vejer de la Frontera in southern Spain, and offers Spanish recipes and cooking tips. You’ll love her easy chocolate and almond cake or, if you are looking for a delicious Moroccan dish, then try Annie’s Chickpea, Orange and Mint salad. Mmmmm …. delicious! So that´s the CBBH Photo Challenge for March, folks. Remember, all you have to do is post your entry by the end of the month, tag your entry ‘CBBH Photo Challenge’, link back to this blog and, most importantly, don´t forget to add links to any two blogs that you´ve commented on during the past month, so that we can all HOP OVER and have a look. Make sure you FOLLOW THIS BLOG so you don´t miss next month’s exciting challenge! This entry was tagged Andalucía, CBBH Photo Challenge, East of Malaga, Europe, flowers, garden, gardening, gardens, photography, Spain, travel, weather. Bookmark the permalink. Fabulous rain captures, Marianne! We are have terrible drought…. OH dear, are you Amy? The world weather is all over the place, isn’t it? Enjoyed looking through these pictures!! Really good camera skills! I actually live in Málaga right now taking language classes (http://alhambrainstituto.com/ , it’s a really good school a little outside of Málaga) and I simply loooooove Andalusia so much! Can’t get enough of the countryside and its diversity! Great way to answer the challenge, Marianne. The photos were beautifully shot, the colors stunning. The flowers are beautiful, but that lemon is gorgeous in its watery blanket. Our rain comes over the winter months …. we often don’t get a drop of rain from early May until October. Hmmmm … I guess not! We have a cyclone heading in this weekend…so there might be a shot or two after that hits. Time to go out and now and batten down everything. The wind is so strong it is drying the raindrops as they fall! Now, if you put out a challenge of ‘after the wind’ I’m sure I could oblige. Love your photos. On this side of the world(New Jersey), it would be very difficult to take any “after the rain” pictures. We are expecting more snow tomorrow night – our 18th snowstorm. OH dear … not MORE snow? I just love seeing your amazing pictures Marianne thank you and for the dialogue that accompanies them. Awwwww … thank you Pat. You know, it’s comments like this that make it ALL worthwhile. Beautiful pictures! We have had winds and some nasty fires around here in the last couple of days. Would love to wake up to scenes like this. I’ve got my camera at the ready this month Marianne! Look forward to seeing your photos, Sophie. HARDENBERGIA comptonianasa – have just purchased one. Hoping for third time lucky, as last two have been failures in my windy garden. But it is such a lovely showy plant that it deserves one last chance. Thanks for that, Maggie. I’ve edited the post and credited you for identifying it. The purple flower is Hardenbergia. In Australia we call it Native Wisteria. It’s the climber that’s growing up to meet the fungus on the tree in my last post, the tree in the Botanic Gardens. It’s a good plant, not an invader, even though it grows quickly and covers ugly fences with beautiful purple flowers in spring. They’re nice in a vase with other flowers. Love all these photos of raindrops. Great camera work.